Microsoft has revealed that its augmented reality projector IllumiRoom is unlikely to hit shops in its current form as it is far too expensive. Speaking to AusGamers, Albert Penello, head of product planning for Xbox One, said that although the technology was great to use, the price to set it up would be beyond most gamers' wallets. "I wouldn't expect you'll see that," said Penello referring to IllumiRoom, explaining: "It's very, very cool tech but it's, like, for a consumer, it requires projectors and things." It's these "projectors and things" that pushes the price into the thousands which, Penollo notes, does mean that it is unlikely to ever reach stores. "[IllumiRoom] is really super-neat if you're in the lab and you've got Microsoft money and you could totally set up this awesome lab, but... we looked at it, but for an average customer it's, like, thousands of dollars [for the set up]." This will come as disappointment to those who have been looking forward to Microsoft's IllumiRoom coming to living rooms. 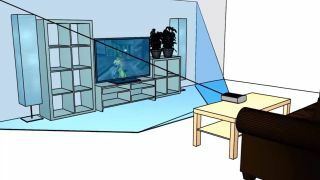 The technology essentially projects on-screen footage on to a room's walls and uses Kinect to control what you see and where. There was a rumour that it would end up in the Xbox One, but this technology is now unlikely to be seen outside of a conference centre for some years to come. Love projectors? Well, what about one on an Android tablet?